​ we release ourselves of its dense energy and open ourselves to attracting more abundance. Allurynn’s beautifully illustrated mini e-book is a heart-centered, wisdom sprinkled guide with step-by-step instructions for making declarations that put wheels under your dreams. with a step-by-step instruction that was easy to understand and powerful implementing. work make this one of my favorite readings to consult when working with affirmations. throughout my life as well. Thank you for the playful invitation! 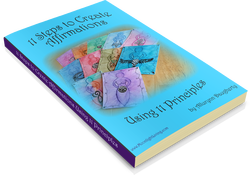 The "11 Steps to Create Affirmations Using 11 Principle” is a powerful message in a colorful package. Allurynn has broken down the hows and whys of creating affirmations into 11 easy to follow steps. In just a short time I was able to craft some great affirmations that I can start using immediately to improve my life. Her colorful artwork has inspired me to dress up my words with color and image to make them come alive. Thanks Allurynn, for putting together such a lovely tool for transformation! Life Coach with a Creative Twist!